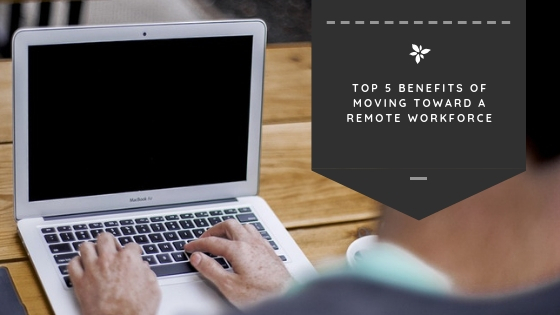 Making the move toward a remote workforce can be tempting. It has been the trend, particularly among tech companies and startups, to make the move toward a remote workforce and provide some flexibility to their organization. Even large Fortune 500 companies have started to make the move toward a higher percentage remote workforce in recent years. The move is often driven by a need to cut costs and modernize organizations to compete in a global economy that has shifted in recent years. Leveraging the benefits provided by a remote workforce can improve cash flow, lower overhead, and provide more satisfaction among employees. There is a lot that can be gained that comes from providing your employees with more flexibility than traditional positions offer. Easy-to-use technology solutions and the rise of reliable high-speed internet have made remote work a perfect solution for companies that would like to modernize, attract new talent, and change the way that they operate to prepare for the future. Fewer employees in the office means that you need less office space. That, along with all of the additional investments that you need to make to support traditionally employed individuals, can really add up over time. Today, many organizations have placed increased focused on being leaner and more agile in the decisions that they make. Large companies are marked by their bureaucracy and slow decision-making. Smaller companies compete by being able to make faster, more meaningful decisions. A remote workforce often means more part-time employees. Those employees might even be contract workers, which means that the organization is not necessarily required to provide them with benefits and health insurance — although those benefits would certainly sweeten the pot and attract a higher level of talent. One strong argument for a remote workforce is the increase in productivity that companies that go remote often see. Remote teams not only get more done, they are more willing to go the extra mile to ensure that they get things done right. The privilege of working from home is a huge incentive for people that enjoy remote work. A recent study found that 53% of remote workers say that they are willing to work overtime. Compare that to traditionally employed people, who came in at only 28%. A two-year long study from Stanford confirms these results. Their study showed huge increases in productivity when people work from home — particularly when they work from home only a few days per week. These results should push companies to consider whether or not a partially remote workforce might be a good choice for them. When you hire remotely, you aren’t limited by your geography. You can hire people from anywhere in the world to come and work for your organization, so long as they are in a time-zone that will be a good fit for the needs of the positions. According to a recent study, 70% of employees will look for the ability to work remotely, and it will be an important decision when choosing their next job. If they will need to work closely with other people in the organization, you might not want to expand your search to people on the other side of the world. Still, the access to the larger talent pool means that companies can connect with talented individuals that may be a perfect fit for the position. Remote employees have lower turnover rates. 95% of employers that utilize remote workers state that hiring remote workers has had a major impact on their ability to retain employees. The process of hiring, training, and integrating a new employee is costly both in terms of dollars and time. Less turnover and updates to your org chart will be felt across your company. Offering the ability to work from home has been shown to keep employees happy because they enjoy the flexible work options. In fact, 82% of remote employees have stated that they enjoy the flexibility that a remote position provides. Many find that it is easier to attend to day-to-day life when a commute isn’t part of the equation. Lower turnover is a huge incentive for any company. Mitigate the risks and costs that are associated with a new hire could save a company tens of thousands per year. Additionally, the lower turnover rates means that employees will be able to improve at their job over time and reach a higher level of skill than would otherwise be achievable. One often overlooked benefit of having a remote workforce is that it allows your company to experience improved wellness in the ranks. Those pesky strains of the flu won’t run rampant throughout your office, knocking out a significant portion of your workforce at a critical time of the year. Still, even if they did come down with the flu, 75% of remote workers say that they would be able to continue to work while sick from home. Outside of the flu season, remote workers see increased wellness throughout the year. Companies with remote work options report 63% fewer unscheduled absences than companies that don’t. Organizations that place value in the wellness of their employees will at least provide some remote flexibility options so that their teams can effectively maintain their health without exposing the rest of the company to the illness. In the end, having a remote workforce just gives companies and the people that they employ more flexibility. It increases the talent pool, giving companies access to a larger range of talent. It also helps companies to hold on to the employees that they hire, as they enjoy the increased freedom and flexibility that comes with remote positions. Ultimately, whether or not a remote workforce is a good fit for a company is dependent on a number of factors. But, the benefits are numerous and can’t be overlooked.